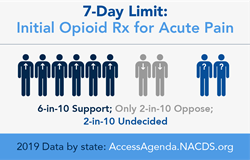 The seven-day limit for initial acute-pain opioid prescriptions is consistent with pharmacists' recommendations from the front-lines of care, their collaboration with law enforcement, and the needs of chronic pain sufferers. The National Association of Chain Drug Stores (NACDS) today welcomed the introduction of legislation that would limit to a seven-day supply the initial prescriptions of opioids for acute pain – a move that is consistent with the Centers for Disease Control and Prevention’s (CDC) guidelines for prescribing opioids. The bill is consistent with one of NACDS’ priority public policy recommendations to help further address the opioid abuse epidemic. NACDS’ recommendations relate to initial-prescription limits for acute pain; prescription drug monitoring plans (PDMP); drug disposal; and mandatory electronic prescribing. The legislation would build on the SUPPORT for Patients and Communities Act (H.R. 6), enacted in 2018, which is consistent with all of NACDS’ recommendations and which was particularly helpful in requiring electronic prescribing for Schedule II through V controlled substances prescriptions covered under Medicare Part D to help prevent fraud, abuse and waste – with limited exceptions to ensure patient access. The legislation also is consistent with the White House’s 2019 National Drug Control Strategy, which NACDS welcomed in February. In addition to advancing its public policy recommendations, NACDS and pharmacies maintain longstanding and ongoing initiatives to prevent opioid abuse, including compliance programs; advancing e-prescribing; drug disposal; patient education; security initiatives; fostering naloxone access; stopping illegal online drug-sellers and rogue clinics; and more. NACDS’ Chain Pharmacy Community Engagement Report indicates that opioid abuse prevention stands as one of the top priorities for NACDS members among their community engagement initiatives.